A couple of decent pics of what looks very much like Tottenham’s next home shirt, made by Puma. First thoughts? I really, really like it. There’s something charmingly retro about it, whereas many of the other new ‘retro’ kits seem cynical somehow. It’s certainly one of the better Puma kits in recent seasons, not that that’s saying much. Puma’s World Cup 2010 kits are mostly awful. Of course, once a sponsor’s logo is added, it will look one thousand times less stylish. Bah. Like it . It’s got a very early 80’s feel to it. Best Spurs kit since we picked up Puma. Nice. Other than the overabundance of Puma logos. Woudn’t one on the front be enough? 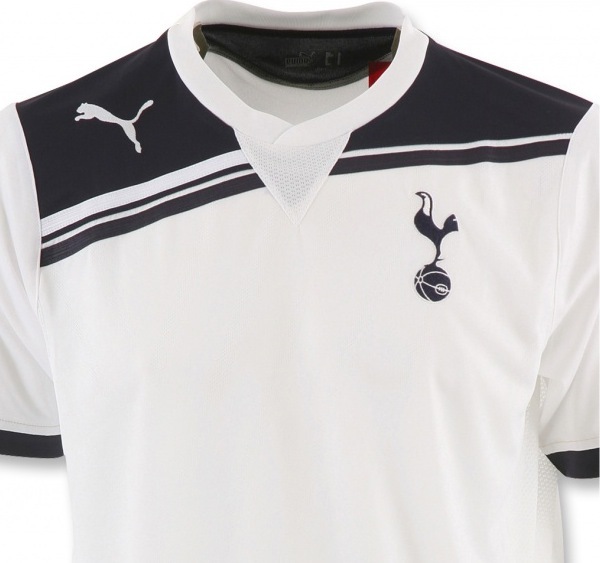 As someone who really isn’t a Tottenham fan, I think this shirt looks quality – it’s got a real retro feel about it, but can’t ever remember Spurs playing in anything too similar. I reckon if you get Holsten to sponsor them again that would finish it off nicely!! I thought we switch to Adidas next year?!? So I assume this can’t be the real deal….